TFHRCâ€™s intelligent intersection delivers SPaT and GID data to a test vehicle equipped with a DSRC modem, computer processor, and a display device to provide the driver with speed advice. They say timing is everything. And time is money. Or, when it comes to driving, fuel. Say you’re approaching a traffic light, trying to make it through an intersection. You wonder how long the light will last. Should you slow down, stop, or speed up? What if timing was not just chance and the time you saved driving through green lights without stopping meant burning less fuel and reducing emissions? Current research has demonstrated potential for encouraging “green” approaches to signalized intersections. 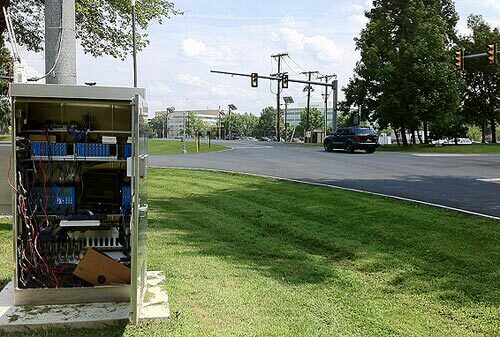 At FHWA’s Turner-Fairbank Highway Research Center (TFHRC), recent environmental performance experiments using data acquisition and analysis tools indicate a reduction of harmful emissions by about 12 percent and fuel savings between 10 and 20 percent. This savings is based on the energy a vehicle can save by approaching and moving through an intelligent intersection strategically. Hosted by FHWA’s Office of Operations R&D and directed by the University of California, Riverside, the experiments were sponsored by the U.S. Department of Transportation (USDOT) Intelligent Transportation Systems initiative, Applications for the Environment: Real-Time Information Synthesis (AERIS), which is identifying transformative concepts to improve environmental performance. On August 23, researchers used TFHRC’s intelligent intersection to provide Signal Phase and Timing (SPaT) and Geometric Intersection Description (GID) data to a test vehicle equipped with an onboard dedicated short-range communication (DSRC) modem, onboard computer processor, and a display device to provide the driver with speed advice. As the vehicle approached the intelligent intersection, the onboard computer received SPaT and GID information from roadside equipment (RSE) connected to the signal. The computer interpreted the data and performed velocity planning, sending a message to the display device, which informed the driver the light would change to green and suggested a safe speed for approach and departure legs at the intersection. Using connected vehicle technologies, researchers were able to achieve the first objective of the project, which was to reduce emissions. They also accomplished the second objective, which was to reduce fuel consumption. To optimize fuel economy, the best scenario would be a vehicle cruising through a green light without having to slow down or speed up. Other energy saving scenarios include a vehicle safely speeding up or slowing down to make it through a green light and slowing down early and coasting to a stop at a red light. Signal timing and intersection location data were obtained using connected vehicle technologies such as 5.9 gigahertz DSRC wireless communication, a global positioning system, SPaT, RSE, and onboard equipment. The in-vehicle display device has a speedometer with a green area indicating the speed range the driver would have to maintain to make it through the light without stopping. There is also a green bar that shows the seconds left in the signal phase. This device allows experimenters to adjust vehicle speed to closely match recommended speeds. Because of potential safety hazards related to driver distraction, speed adjustment is only used for experiments. 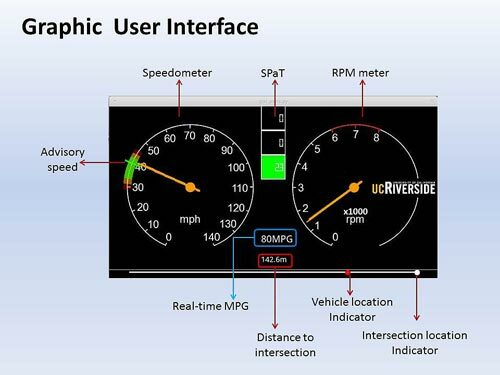 The display device in the research vehicle has a speedometer that indicates the speed range the driver would have to maintain to make it through the light without stopping. TFHRC’s intelligent intersection is equipped with a comprehensive traffic signal control system, a DSRC system, an advanced system for the detection of vehicles and pedestrians, a fiber-optic communication system, a driver infrastructure interface warning system, and a separate traffic signal cabinet with computers and communication devices. The DSRC system can transmit information 10 times per second to vehicles equipped with DSRC onboard units. The experiments offered quantitative data on the performance of an AERIS application; allowed researchers to assess the practicality of implementation; gave them a better understanding of a potential user’s experience; and rendered data that can be used to calibrate and validate future AERIS computer modeling efforts. FHWA’s research in this area is connected to a larger effort involving public and private researchers who are trying to improve safety through intelligent infrastructure and connected vehicles. This broad USDOT initiative includes research at the Research and Innovative Technology Administration and the National Highway Traffic Safety Administration. The Agencies are working together on a project called Safety Pilot, which is focused on advancing tests of applications under real-world, multimodal driving conditions to determine effectiveness, safety, and ability to help reduce crashes.